Welcome to the cinematic universe of Abbas Kiarostami—low scale on effects and plot, but very high on character, Iranian culture, and creative point-of-view camera work. His simple films appear sparse, but the images often profoundly stay with the viewer for a lifetime. 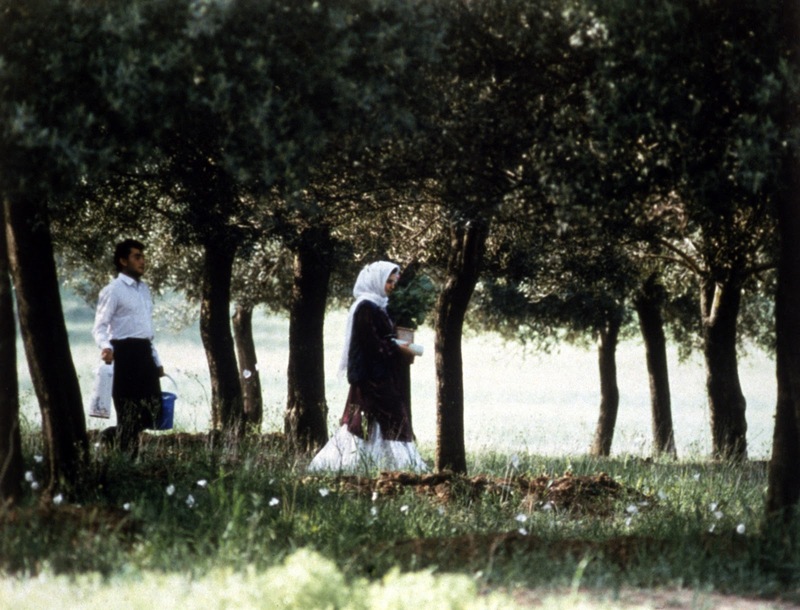 Through the Olive Trees is a quintessential Kiarostami film—it exists between film fiction and reality. The purpose of this film within a film is to illustrate the tedious process of filming the a film while focussing in on replacement actor Hossein's romantic pursuit of the stubbornly unresponsive Tahereh, who has been cast as his new bride. The director parallels Hossein's challenges with unreciprocated love with various filming frustrations. Things just don't go according to plan for the director. Some are expected when using amateurish non-actors, while others are caused by cultural hang-ups or relationship problems. For instance, Hossein, the first lead actor stutters when talking to a girl and must be dismissed. Tahereh shows up on the set in a new party skirt instead of the required peasant dress and won't talk to the replacement. Hossein keeps forgetting his lines when he confuses his real life with the scripted one. To call the pacing of Through the Olive Trees slow would be a gross understatement. It is glacial in pace especially when Kiarostami demonstrates take after take after take of the same scene, to the point that we gain the director's point of view and feel like throwing up our hands when an actor screws up. But this hammering approach of the director ultimately achieves something unusual for such a film. We feel like we have been through the directing experience, and by the end of it many of the lines are indelibly engraved into our minds. Despite the sameness of many scenes, small detailed differences surface with each new take—pointing out skill that comes with making a piece of art that is bent on achieving perfection. 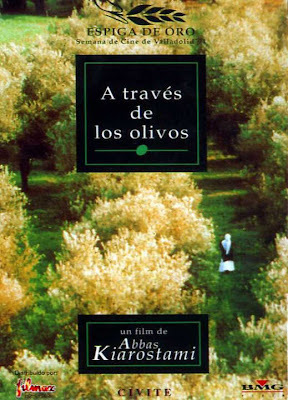 The final scenes of the film are classic "Kiarostamic", profoundly philosophical and evokes intense curiosity. His camera sits perched on top of a hill, overlooking a breezy valley of olive trees, as Hossein pursues Tahereh. The long shots extend to even longer shots to the point that the two people are tiny white flecks moving across the unspeaking greens of the valley. And yet Kiarostami's camera continues to roll on its tripod for another five minutes. I am yet to come across a film that specializes on long takes and glacial pace, and yet in its culmination point invokes so much calmness accompanied by a sense of uncertainty. I guess that many arthouse lovers will find this film rewarding and memorable. On a deeper level, the film seems to be asking unanswerable questions about the differences between a movie and reality (life as art) and questions the problems faced by filmmakers as they try to tap into cinema's unexplored potential. On that level, the film was stimulating as an intellectual experience.